This is one of the most intriguing divisions in football, because all four teams have a legitimate chance to make the playoffs. The NFC as a whole is very competitive conference, so attrition will cause some of these teams to have a worse record than they deserve. Overall, this will be the best division in the game according to my predictions. The Packers made two free agent signings this offseason, as they continued their long-standing strategy of not worrying too much about using their cap space in free agency, and rather building their roster through the draft. Even without Aaron Rodgers for most of eight games, the Packers wound up winning the division. That had more to do with the Lions and Bears failing down the stretch, but it also shows that the Pack were decent enough to stay afloat while Rodgers was out. The offense could possibly be the best in the NFL, because obviously, Aaron Rodgers is Aaron Rodgers, and should most likely have both Jordy Nelson and Randall Cobb healthy for the majority of the season. Jarrett Boykin looked good out of the slot last year, even with the revolving door of Seneca Wallace, Matt Flynn, and Scott Tolzien throwing him the ball. The running back should be very good as Eddie Lacy will be even better in his second year in the league. He should be one of the best running backs in the NFL this season, especially behind an offensive line that's pretty good, as I expect to see the Packers commit to the running game more often. One of those free agent signings was Julius Peppers, a contract that I didn't really like at the time, but we'll see how he plays this season. B.J. Raji is wildly overrated, and I'm not so sure how much the Packers will miss him on the interior of their line. The rest of the defense has a chance to be great, given that Clay Matthews is healthy, which is never a guarantee. Nick Perry, Brad Jones, and A.J. Hawk are decent linebackers next to Matthews, and the secondary is awesome. HaHa Clinton-Dix joins Morgan Burnett, Casey Hayward, Tramon Williams, and Sam Shields in what will be one of the better defensive backfields in the game. All in all, the Packers are primed and ready for another very good season, and should be one of the early favorites to win it all. There has been a massive shift in the identity of the Chicago Bears over the last couple of years, as a team that has always been known for its defensive prowess, while historically being average or worse on offense has become an offensive juggernaut with a rather suspect defense. I like Jay Cutler, and I think he has always unnecessarily gotten a bad reputation. He's somewhat inconsistent, but overall he's an above average starter. He's definitely not going to light the world on fire by himself, but with Matt Forte, Alshon Jeffery, and Brandon Marshall surrounding him, Cutler should have a great season. Obviously, health is always a question with Cutler, seeing as he hasn't played in all 16 games since 2009. Even with Jimmy Clausen as the quarterback should Cutler get hurt again, I don't see how this offense can be anything short of exceptional. Marshall and Jeffery are two of the best receivers in the game right now, and the same can be said about Forte's ranking amongst running backs. Right tackle Jordan Mills is a concern, but the rest of the offensive line is solid. If Mills proves to be an issue, that could derail to offense slightly, but the skill position guys are way too good. However, there's a good chance that he improves, because rookie lineman tend to develop slowly. They improved their defensive line with free agent signings Lamarr Houston, Jared Allen, and Willie Young, which helps to form a pretty solid line along with Jay Ratliff and Stephen Paea. The linebackers have the potential to be awful once again. Lance Briggs has been Hall of Fame worthy in the past, and, when healthy, he's still quite good. My issue is with whoever lines up next to him. Shea McClellin was a total bust in his first two seasons, playing as a lineman after being drafted in the first round. Now the Bears have made the decision to test him out as an outside linebacker. Alright then...good luck with that Chicago. D.J. Williams looked pretty bad last year (which can be said about this entire run defense), and all of the backups are horrible, with Jon Bostic, Khaseem Greene, and Jordan Senn playing behind the starters. So, overall there is not much hope for this unit. It probably could be one of the worst in the league, and if Briggs goes down again, it will be high comedy watching these linebackers get embarrassed on play after play. The secondary should be alright. Tim Jennings and Charles Tillman weren't so good last year, but each have a track record of quality performances, so it's safe to expect a bounce back season. Rookie Kyle Fuller will see some action in a hybrid slot corner and safety role. The defense has a ton of questions, but the offense should be incredible, making the Bears a dangerous team in this upcoming season. Looking at those ranks, along with the fact that Matt Flynn/Seneca Wallace/Scott Tolzien, Josh McCown, and whatever the hell was happening in Minnesota were the starting quarterbacks in the division for a significant part of the stretch run, it's hard to imagine how the Lions finished 7-9 and failed to qualify for the playoffs. I blamed Jim Schwartz's coaching then, and I will continue to blame Schwartz now. It was awful to see such a talented team fall apart at the end of the season. I expected them to look for a major upgrade in the coaching department. Instead, the Lions went ahead and hired Jim Caldwell. This offense is great, which should be obvious. Matthew Stafford is somewhat inconsistent, but that doesn't matter because he has Calvin Johnson on his team. I could be a Pro Bowl caliber quarterback with Calvin Johnson on my team. Remember, he's Calvin F***ing Johnson. Across from him this year will be Golden Tate, a massive upgrade over the Kris Durham show that we were subjected to last season. 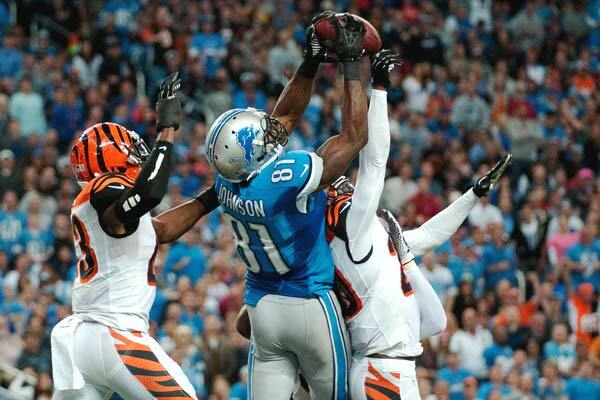 I'm not Tate's biggest fan, but he's probably the best receiver to have teamed up with Johnson during Megatron's career. And the running game is going to be great. Joique Bell and Reggie Bush form a dynamic duo out of the backfield. Even with Bush's perennial struggle to stay healthy, the Lions won't skip a beat with Bell as their bell cow (pun intended). The defense lost Willie Young to the Bears, as well as Louis Delmas to the Dolphins, while the only key player acquired was James Ihedigbo. Ihedigbo is not as good as Delmas, the guy he is replacement, but the dropoff shouldn't be horrible. The rest of the defense is alright, and the biggest hope for this team is that both Nick Fairley and Ziggy Ansah improve, forming a dominant line in both run and pass defense along with Ndamukong Suh. Other than that, they should be an average defensive team, much like they were last year. The Lions are going to be a pretty good team this year, but their record probably will not reflect that. The NFC is going to be very tough, and Detroit will happen to be one of the many casualties of that fact. In most other years, this team would be a bona fide playoff contender. This season, I don't see how they would be able to jump over some of the other teams in the conference. I love this team, and the only reason why I stopped myself from having them win at least 9 games is because I do not know how many games Teddy Bridgewater will start this season. I somewhat understand why they decided to go with Matt Cassel at the beginning of the year, because Teddy's not exactly a finished product, but if the former Louisville signal caller would have played 16 games, I would have fallen in love with these Vikings. Side note: I love how Christian Ponder is so bad that there was absolutely no conversation about him sniffing the starting role to begin the season. I think the offense is going to be just as good, if not better than last year, regardless of who the starting QB is. Greg Jennings and Kyle Rudolph are nice pass catching options, Adrian Peterson is of course amazing, and Cordarrelle Patterson could have a monster year as a big play wideout. The really interesting part of this team is the defense, which was one of the worst in the NFL last year. The offseason was mostly spent upgrading that side of the ball by pickup up a slew of decent free agents such as Captain Munnerlyn and Linval Joseph that should help the Vikes. They also took Anthony Barr with their first draft pick, and he is going to be a great pass rusher. The biggest improvements on this defense should come from within. Xavier Rhodes struggled at the beginning of his rookie season, but improved greatly towards the end of the year. Everson Griffen was re-signed to a pretty big deal in the offseason, and under defensive-minded Mike Zimmer, it's very possible that Griffen will have a great year. They put together a great draft, and are doing a great job of building their team for the future. Once Bridgewater takes over the starting job (because Teddy Time is bound to happen at some point this year) watch out for this team, because they will be tough to beat. Eddie Lacy will lead the NFL in rushing yards. You know what? Why not? The line is good, and the Packers offense will be dynamite. Jay Cutler will play 16 games this season. The offensive line will be better, so Cutler won't take as many hits. Joique Bell will have 400 more yards from scrimmage than Reggie Bush. I love both of these running backs, but everything that I've seen over the past couple of years suggest that Bell is a better player. That, combined with Bush's long injury history makes me confident that he'll be the feature back by the end of the year. Cordarrelle Patterson will score 15 total touchdowns this season. He scored 9 touchdowns (3 rushing, 4 receiving, and 2 kickoff returns) last year, and I think he'll take on a much bigger role in this offense. He'll appear in all sorts of different packages, sort of like a poor man's Percy Harvin, finally giving Minnesota a viable big play option alongside Adrian Peterson.